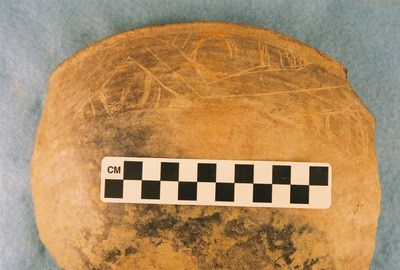 "41CP12, Burial 19, Pot 2" by Timothy K. Perttula and Robert Z. Selden Jr.
DECORATION: The rim has an engraved alternate nested triangle motif repeated six times around the vessel; there are six triangles with their apex pointed towards the carination and six with their apex pointing towards the rim. Each nested triangle has excised and/or hatched corners as well as an excised hook or spur within it. There is also an interior horizontal engraved line at the vessel carination point. Ripley Engraved, var. Williams carinated bowl, Burial 19, Pot 2.